I am happy to announce that I am hosting a sale on my Etsy shop, now through the fourteenth! 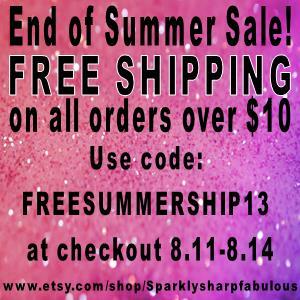 Free shipping on all orders over $10. I’ve currently got nail glitters, fake nail art spines, and of course some of my indie polish Princess Glamour up for grabs. If you aren’t familiar with my Princess Glamour polishes, check out this overview video of them here. Be the first to hear about promotions and coupon codes by following me on Twitter or Facebook!